The Marine area of Tarumizu at the foot of Mt. Sakurajima,the best place for Amberjack to be. Tarumizu is located in Kagoshima Prefecture, the southernmost region of Japan excluding Okinawa, and has a 37-kilometer long coastline facing Kagoshima Bay. The landform and the warm climate provide a suitable habitat for amberjack breeding. The mineral-rich water welling out of the Takakuma Mountain range flows into Kagoshima Bay and makes the sea a great fishery ground. 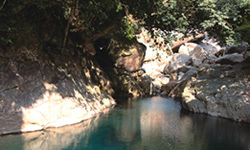 Sarugajo Valley: Clear and cool water runs into lush greenery. Masakari Bathing Beach: Looking out over the calm and shallow beaches of Kagoshima Bay and Sakurajima. 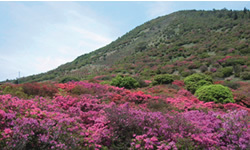 Takatoge Park: 100 kinds of wild azalea turn the park red and pink in spring. 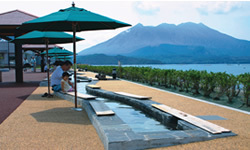 Michi-no-Eki (Roadside Station): You can enjoy a footbath surrounded by great views of Sakurajima, Kagoshima Bay and the Kirishima Mountain Range. 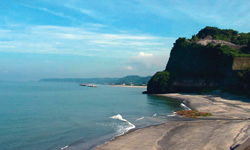 Kagoshima Bay is blessed with oxygen-rich, clean seawater with an annual mean water temperature of 22 degrees Celsius. The average water depth of 120 meters allows for deep fish pens even near the coast. What do you think about "UMI-NO-OHKAN"? In 2004,Tarumizu City Fishermen's Cooperative received "Kagoshima no sakana" brand recognition.